Used this design on a t-shirt for my granddaughter. She loved it. It has a burst of bright colors. I changed the colors to black, bottle green, gray, dark blue and have had endless compliments and requests. Stitches so professionally. Put it on the front of a blouse. It appeals to the eyes. It is a great design, I used it on a shirt pocket. Used this design on dish towels! I made this design and it looks adorable. I have stitched this design twice on two different garments. I am very happy with the way it turned out. This stitched out very well! Cute design! Haven't had chance to use yet but downloaded easily. 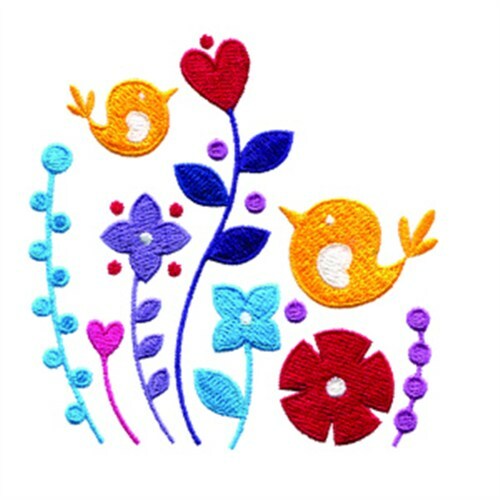 AnnTheGran is happy to present Birds In Flowers machine embroidery design which has 11586 stitches and is [88.90 mm x 88.90 mm] large. If you would like to view more embroidery patterns please search on our embroidery designs page.